what a poignant poem...metaphor to all..it's sometimes a teardrop a must for 'crack' to start to heal....blessings! Really like how the crack seems quiet and yet dangerous, and how the words merge into the crack. This feels like the anatomy of a panic attack. The way the lines are snipped and shaped here, and especially the constriction (or is it an expansion in a different direction?) of the words into that sharp shape...really nicely done. "Small neck snapped" really got me. And the dread of the seep. 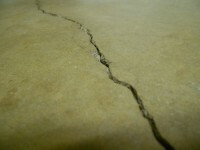 I wonder if the crack will widen or heal itself as the breathing continues. I wonder, but do not have an answer. I can see how that poor thing laying there... and that constriction making breathing hard. An impactful piece rendered in a mesmerizing form. What a sad little poem. Breathe. I loved the way you ended the poem. Inspiring indeed.